If you’re thinking that Joe Wallis does not look like a major league baseball player, you’re not really wrong. Wallis would never play a major league game after this card hit the stores. Not incidentally, Wallis didn’t always look like this. He broke into the big leagues in 1975 with a well-trimmed goatee and collected 16 hits in 56 at bats for a respectable .286 average. One of the hits even garnered Wallis his single shred of enduring notoriety as it broke up a Tom Seaver no-hit bid with two outs in the bottom of the ninth inning. 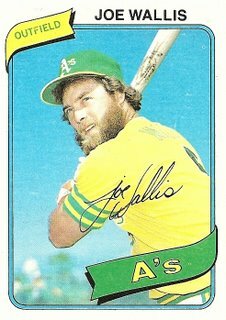 In 1976 and 1977, Joe Wallis sported long incurving sideburns and a thick mustache and hit .254 the first year and .250 the next. That style of facial hair devolved into a disorganized stubble and mustache look in 1978, when his average sunk to .249 while he split time between the go-nowhere Chicago Cubs and the thoroughly gutted Oakland A’s. During 1979, as the stubble expanded toward the unruly beard shown here, Wallis’s average guttered to .141. He moved outside the realm of recorded history after this, but anecdotal evidence suggests that his beard grew longer and longer throughout the 1980s, and as it did so Joe Wallis eliminated from his life more and more of what he came to see as the entrapments of a thoroughly corrupt modern civilization. He threw his television out a 12th story window in 1982, stopped using electricity in 1984, ceased showering in 1987, began living in a tipi in 1991, and some time in the mid-1990s disappeared altogether, maybe or maybe not partially or fully responsible for occasional sightings in the forests of the Pacific Northwest of a profoundly hairy humanoid creature unable or unwilling to respond to verbal inquiries or hit a curveball. You are currently browsing the archives for the Joe Wallis category.